The Pastoral Care Team organizes practical help for members and friends who are in crisis. Team members are a presence for these needing emotional support. They share in moments of joy, celebration, and sorrow, and assist people in finding community resources. Pastoral Care members make visits to homes and hospitals, communicate joys and sorrows through the Fellowship newsletter, and provide confidential, nonjudgmental, empathetic listening and support. On May 20, 2001, after a year of study and discussion, our Fellowship passed a resolution to become a Welcoming Congregation, joining a nationwide Unitarian Universalist Association program to end discrimination against gay, lesbian, bisexual and transgender people. This means that we affirm and include people of all sexual orientations in our Fellowship. 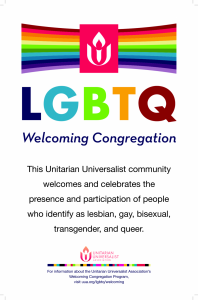 This affirmation of bisexual, gay, lesbian and transgender experience flows naturally from the Unitarian Universalist belief in the inherent worth and dignity of every person. building awareness of and rectifying environmental injustices.